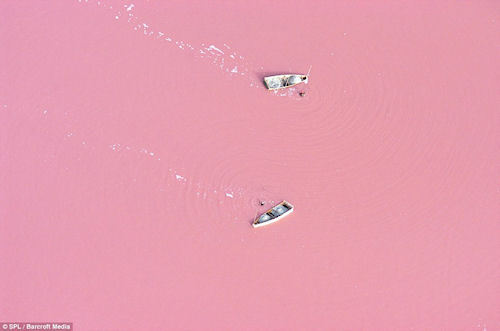 While not quite a fashionable ‘Apocalyptic Red’ color, Lake Retba in Senegal, West Africa does something flamboyantly cool… it turns pink… like awesome strawberry-milk pink. Lake Retba and the Dead Sea were given those names because it they were once thought to not be able to harbor life. Those lakes however are alive with a salt-loving organism called Dunaliella Salina which produce a red pigment that sunlights helps to turn pink. Workers who harvest the salt often spend six to seven hours in the waters of the lake and cover themselves with shea butter which helps provide skin protection and from having salt crystals adhere to their bodies during their time in the lake.